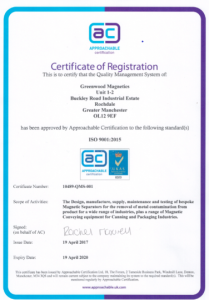 As part of an ongoing commitment to demonstrating the highest quality products and service, we are pleased to announce that our quality systems have been audited by Approachable Certification Ltd and awarded ISO9001-2015 accreditation. The certification covers the manufacture and supply of magnetic separators and bespoke magnetic assemblies. Despite this being the first time we have applied for ISO 9001-2015 accreditation, we secured the certification immediately, on the first audit, with zero non-conformances. I am extremely proud of the dedication our team has shown enabling us to achieve this prestigious standard with flying colours. Given the stringent requirements for material traceability in the food and pharmaceuticals sectors, we believed it was of the utmost importance to attain the certification. This award testifies to our focus on maintaining our position as a leading company in the field of magnetic separators and delivering the highest quality products and services to our customers.